A couple of times each year I take part in the dialogue of the Anglican Roman Catholic Commission of Aotearoa New Zealand (ARCCANZ). The friendship that marks our ARCCANZ meetings is a sign that here in NZ the prayer of Jesus is being answered. One of the fundamental methods for growth in ecumenism is that we must do together the things that we can do together. 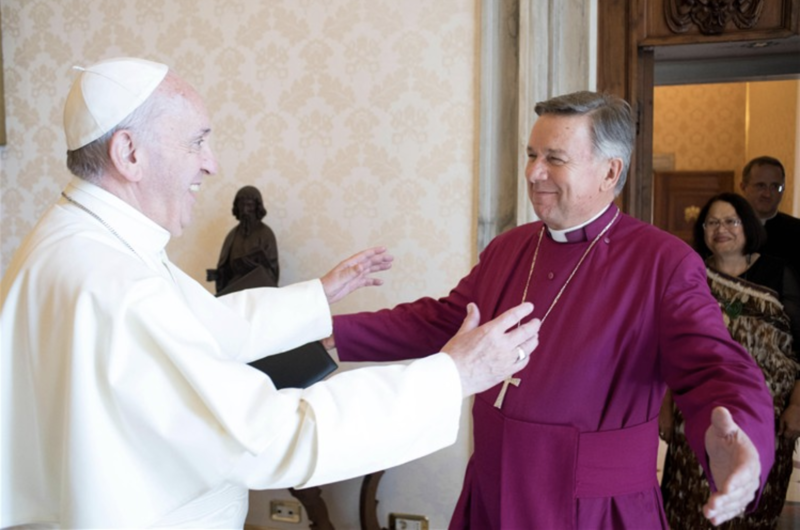 Thanks be to God, and to the growing friendships of faith between Anglicans and Catholics, there is much more that unites us than divides us. A good amount of each of our meetings is given to presentations of papers on some aspect of Anglican or Catholic doctrine in an effort to help us all to grow in knowledge of and respect for each of our traditions. Our March meeting each year is given in large part to a retreat afternoon which yesterday was led by Archbishop David Moxon who until a few months ago served as director of the Anglican Centre in Rome and the Archbishop of Canterbury’s representative to the Holy See. 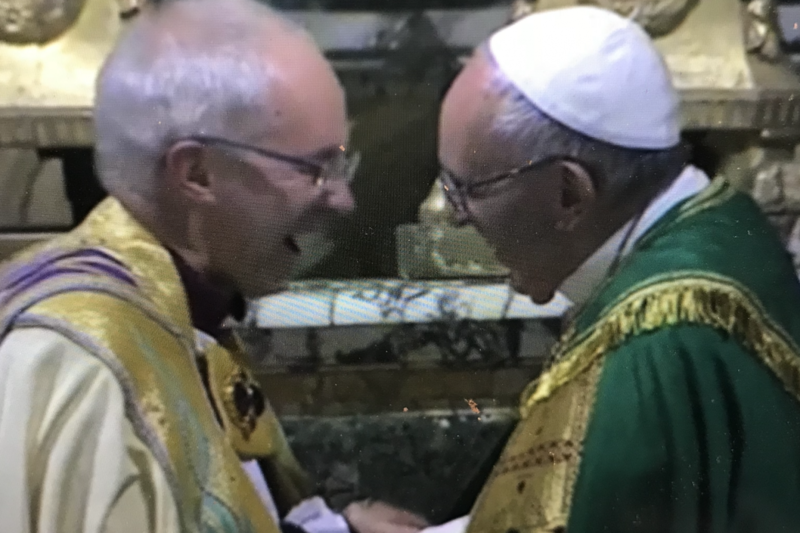 In David’s reflection yesterday it was clear that the friendship between Pope Francis and Archbishop Justin Welby is a significant power for growth and unity between our two churches. Some have thought the best way for churches to move forward towards unity is to ignore differences, discarding any traditions or beliefs that are problematic for other Christians. But this method brings only confusion and unnecessary grief. It is now accepted that unity is most enhanced when each church remains faithful to its own Tradition and traditions, and when we all seek to respect and to understand what is held as central in other Christian traditions. You might take an opportunity to reflect on today’s gospel noting that the heart of the life of Jesus is his relationship with his Father. Too often we try to overcome differences, problems and difficulties by focussing on the problem or the difficulty. The method of Jesus is different. We see Jesus taking his challenges to his Father first. In this relationship Jesus receives the comfort, the affirmation and the strength he needs to work for unity with others. The same method is available to us: taking everything to prayer before we act or react. Jesus will lead us. Church unity will come when we seek to live fully in relationship with Jesus Christ within our own Church communities. The yearning for unity among Christians is a divine desire placed in the heart of every Christian, but ultimately it will be achieved by the action of the Holy Spirit through willing participants in our formal dialogues and daily friendship with those of different church communities. If the opportunity arises during the next day, have a conversation with a person (friend, colleague, workmate or neighbour) who belongs to another church. You might begin by mentioning that you read this post, and perhaps in some way expressing your desire for church unity and your commitment to praying for this unity. At some stage today pray this prayer below for the Unity of Christians which is used throughout the Catholic Church in the Good Friday Intercessions. 8 Responses to "friendship in faith"
It is so good to see this happening. When I was young, there were high fences around churches. Most of these have come down. To visit and understand other houses in the Christian village, tends to give us a deeper love for Christ Jesus in our own tradition. This reflection has me pondering so many layers, the obvious, but also with my siblings who the Lord has gathered though we have scattered; sometimes I wonder if we are from the same planet let alone of one Baptism and one family tree ;), but the prayer at the end gives me Hope that the Lord indeed knows us and we in turn know him….. separately but together, that can be enough. And of course for those coming into our faith communities at Easter, may these coming days be ones, that hold them gently but firmly in their journey with us to the Lord. Thank you Fr John. I look forward to your daily commentaries : 5 minutes to mindfully prepare for the day. Thank you, Fr John. A great reflection. I love the walk of witness in Hutt valley on Good Friday. We have liturgies at various churches reminding us we are one in the Body of Christ. Thank you Father John, I particularly like “you must do together what you can do together”. It is applicable in so many areas of our faith and church life. “That they may all be one” is a prayer of Jesus. Let us pray that, as we journey toward heaven, we may help each other on the road. As Catholics, we need to retain the great gift of the Body and Blood of Christ in the Eucharist, in the Tabernacle and in our lives….praying that all will find this treasure!!!! I also look forward to reading your words each day. I just wanted to acknowledge how beautiful that photo (at the beginning) is! What warmth, love and humour radiates! I would love to have heard what was just said! Thanks John for your offerings during the Lenten Season.